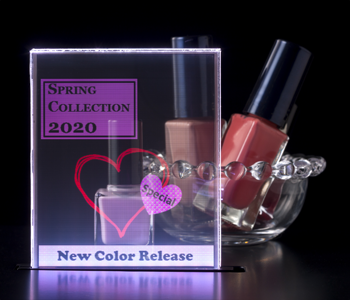 February 13, 2017 (Tokyo, Japan) - Japan Display Inc. (JDI) today announced the development of a 4.0-inch high-transmittance (80%) color transparent display. The newly-developed display will be demonstrated in a mobile gadget prototype which Nippon Telegraph and Telephone Corporation (NTT) and Panasonic Corporation have been developing collaboratively. The display and prototype will be demonstrated at the NTT R&D Forum 2017*1, on February 16-17, 2017, at the NTT Research and Development Center, Tokyo, Japan. The newly-developed display achieves a high transmittance level of 80%, nearly 1.8 times higher than conventional transparent organic light emitting diode (OLED) displays, by applying JDI's new technology that permits the removal of the usual color filter and polarizer layers. The new high transmittance display allows viewers to see the background image and the displayed foreground image clearly and contemporaneously, thereby enabling Augmented Reality(AR)*2 applications in which superimposed images can be easily blended with the background as seen through the display. By fully utilizing this unique, attractive technology, displays can be developed for new applications, such as shop windows, education tools, automotive, etc. JDI is targeting to start mass production of this new display in 2018 fiscal year or later, and intends to apply this technology to larger-sized displays as well. JDI remains committed to continuously offering superior display products featuring advanced technologies. *2 AR (augmented reality) involves the comprehensive use of technologies and systems that extend the user's visual experience by integrating and overlaying additional information, such as computer graphics, onto the real world scene.